May 23rd 2015 marks the premiere of the NIGHT of the JUMPs in Spain! Athletes from the world’s most extreme sports FMX series will go head-to-head in the eighth competition of this year’s FIM Freestyle MX world championship in the bullring at Jerez. The Spanish grand prix is the first event to take place outdoors this year. It’s eleven years since the NIGHT of the JUMPs was last staged in an arena similar to this one when the Coliseum in the French town of Nîmes formed the backdrop for the world’s best FMX athletes back in 2004. This will be the riders’ first outing in a bullring, and the track will also be arranged differently to suit the surroundings. How will the riders deal with such an unfamiliar setup? We’ll soon see! Spanish superstar Dany Torres will be ‘match fit’ in time for the NIGHT of the JUMPs premiere in Spain and should be one of the favourites to secure a podium. 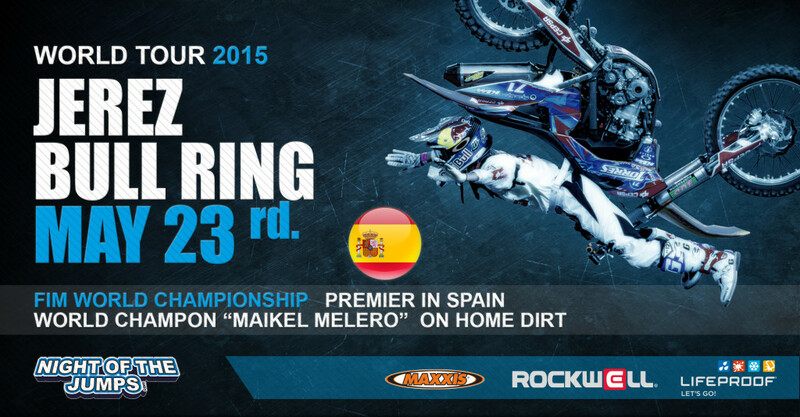 Reigning world champion Maikel Melero will also be eager to prevail in his home grand prix. He has already won four world championship competitions this year and heads the overall standings. Jose Miralles and Marc Pinyol complete the quartet of Spanish riders. Perhaps we’ll see Pinyol pull off the world’s first Inside Roll in competition in Jerez?